I took the plunge and started cutting away at my block! Here’s a little picture of my progress so far. I have a desk in the corner of the living room, with a daylight lamp trained on the workspace, as well as a handy magnifier that clips on to the desk. I’ve got through the first stage – that’s cutting around all the lines with a sharp knife. Some printmakers can achieve the entire cut with just a knife, but the second stage for me is picking up the V-tool and going again around the cut lines, to make a gutter. The white spaces can then be cleared with less risk of accident. For displays, I use mushroom handled cutters supplied by T N Lawrence, but at home I’m very fond of these little Japanese tools shown in the picture. 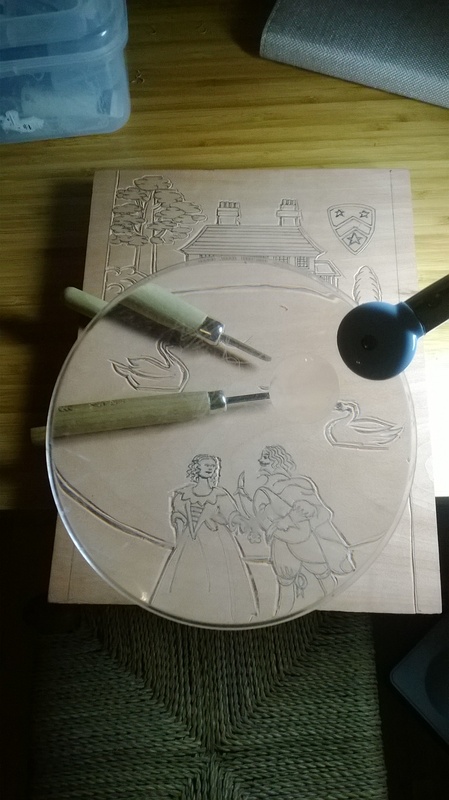 You can get a set for about £15 from Lawrence or Intaglio Printmaker, where I bought mine, and I think they are amazing value. Beginner printmakers are often sold sets with the type of cutter that has interchangeable nibs – good just for the recycling bin, in my view.